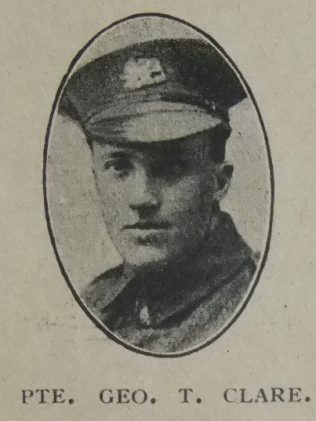 In the passing of Private George T. Clare, who made the supreme sacrifice in France on April 9th, 1918, our Farnworth Church has lost one of its most devoted members and workers. From his earliest days he has been connected with our cause as scholar, member, and a faithful teacher in our junior school. Modest and retiring, he possessed the finest qualities of character, and willingly gave himself to the Master’s service. Though he hated war, yet at the call and need of the country, he responded, and joined the K.O.R.L. After a period of training he was drafted to France in 1917. He was on his way home for a well-earned leave when the German offensive began, and was ordered to return to the line, and shortly afterwards met his death. Much sympathy is extended to the bereaved family, who are loyal members of our Church, Mr. Clare for many years rendered invaluable service as organist, trustee and chapel steward. George was Private 34662 in the King’s Own (Royal Lancashire Regiment), 1/4th Battalion. George worked as an ironmonger before the war.